Lady Emmeline Deschartres could not believe her father. He had promised to allow her to select a husband, yet he now told her that one had been selected for her. Emmeline vowed that she would not marry him. Emmeline had dreamed of finding a knight such as those in the chansons. She wanted a knight who adored his damsel. Instead, her father told her that the king's ministers had betrothed her to Lord Ashton Davenwood. She was certain that he must be the antithesis of her dreams, so she hurried from the castle to allow herself time to think and plan. Finding herself in the presence of a man, Emmeline knew she had been foolish to leave without protection. However, this stranger was everything she had ever wanted in a husband. He was attractive, and made her feel like one of the damsels in the chansons. If only he was the man she was to marry. 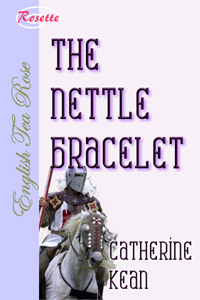 The Nettle Bracelet was a sweet short story of a young woman learning that happiness can come even in an arranged marriage. Although the scenes with the hero were minimal, Ms Kean deftly conveyed his gentle personality. The Nettle Bracelet is perfect when you want a quick romantic read.